On Sunday, the UAE made one giant leap to further promote the sciences environment across the country by launching the National Advanced Science Agenda 2031. In a bid to achieve the objectives of the UAE National Agenda 2021 and the UAE Centennial Plan 2071, this new agenda serves to utilise advanced sciences in the development and creation of solutions to future challenges in the UAE. It will also support the government's current efforts to put sciences in the spotlight. His Highness Sheikh Mohammed bin Rashid Al Maktoum, Vice President and Prime Minister of the UAE and Ruler of Dubai, while launching the initiative said that enhancing the advanced sciences environment in the UAE is the best investment in building the future, and key tool to implementing creative ideas. "Promoting the advanced sciences environment in the UAE is the best investment in making the future and a key tool to turn the creativity of human mind into reality," Sheikh Mohammad said. "We want to make the UAE a hub for advanced science and a top destination for scientists and innovators. We do welcome their contributions and partnership with us in creating a better future for the people. "The empowerment of Emirati scientists and creative minds entails providing appropriate tools and resources to attract and help them transform their scientific knowledge into a practical reality that strengthens the UAE's march to the future through adopting modern technologies and advanced sciences. These sciences provide and develop solutions and deliver answers to many questions but will not make a difference without practical frameworks that transform them into the implementation phase," he added. He said that the agenda reflects the UAE's approach and methodology in the government work, which is based on future-planning, proactive thinking and innovating the best practices and solutions. 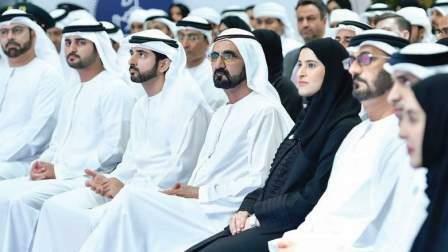 "We all have the potential to transform the UAE into a source of scientific knowledge and innovation. We are waiting for our scientists, who we place high confidence in their minds and potentials, to make the biggest contribution in this field." Sheikh Hamdan bin Mohammed bin Rashid Al Maktoum, Crown Prince of Dubai and Chairman of Dubai Executive Council, Sheikh Maktoum bin Mohammed bin Rashid Al Maktoum, Deputy Ruler of Dubai, and Mohammad bin Abdullah Al Gergawi, Minister of Cabinet Affairs and the Future attended the ceremony. Who is in charge of the initiative? Sarah bint Yousef Al Amiri, Minister of State, will be in charge of overseeing the implementation of the Advanced Science Agenda, which is the result of painstaking efforts of more than 100 experts from 50 leading private and public entities and in cooperation with 55 supportive bodies. The National Advanced Science Agenda 2031 will be implemented with the participation of 10 entities and through setting up councils on the priority sector level. It aims to create a homogenous scientific environment that supports realising the objectives of the UAE Centennial Plan 2071 by backing science and sectors related to science and technology outputs. The agenda outlines the UAE's scientific approaches towards 2031 by working to bring about the objectives of UAE Centennial Plan 2071 through three consecutive strategies starting with 2018-2021. The 2031 agenda focuses on using sciences to devise solutions to challenges and exploring economically viable opportunities by working on eight scientific priorities up to 2031 and 30 scientific targets up to 2021. The eight scientific priorities aim to make the most of all strategic natural resources in the country through national capacity-building, promotion of the sustainable energy sector, enhancement of water security using advanced and clean technology, and development of an advanced scientific food security system. The priorities also aim to address health challenges in the UAE through a national scientific system and developing advanced industries sector, in addition to building a system of logistical support based on scientific studies and data and creating strategic industries complex. The agenda also aims to develop four enablers including economic information services, and promoting entrepreneurship. The leadership is investing in the future. By announcing a National Advanced Science Agenda for 2031, it is nudging the younger generation towards fields that are likely to drive change. Perspectives are bound to change when we start looking for solutions through the prism of science and technology.